Richard C. Miller: James Dean besides his car during the filming of "Giant"
En route to compete in a race in Salinas, James Dean was killed in a highway accident on September 30, 1955. James Dean was a legendary hero with a legendary story; live fast and die young. For over half a century, he has captured the world with his casual style, unflinching look and rebel attitude. James Dean has defined the essence of cool and without-a-cause for generations. His star continues to shine brighter and brighter. 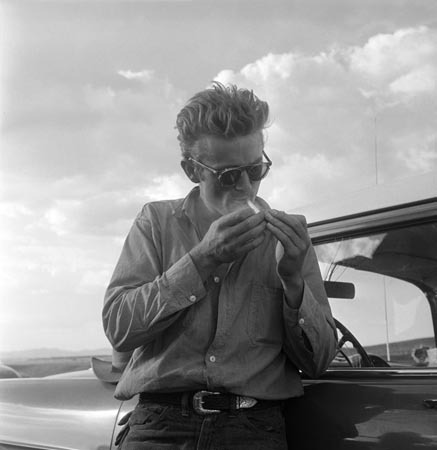 James Dean was a photographer's dream subject, resulting in many now-iconic images. Richard C. Miller worked for This Week, Liberty, Family Circle, Parents, American Weekly, Colliers, Life, and Time; as well as documenting Hollywood. For seven decades, he made a living working for North American Aviation and later as stringer for Globe Photos, which kept him circulating in the universe of stars; and he covered more than seventy films. 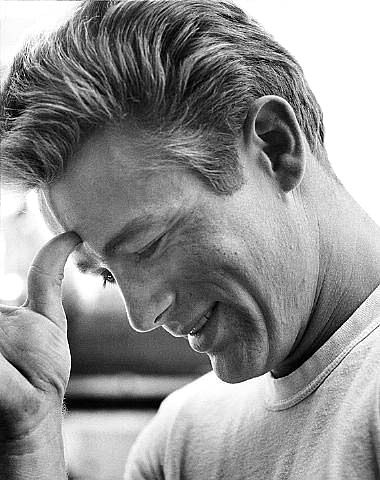 His first on-location assignment was for Giant (1955), where his job was to shadow James Dean. When Dean died, many pictures of him were sold, becoming iconic images since he and Dean had developed a close relationship based on a mutual interest in Porsches and photography. Richard C. Miller: James Dean and Elizabeth Taylor take a break from filming "Giant"